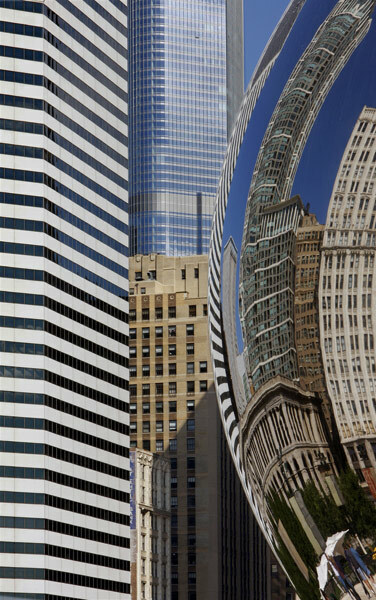 A. Epstein & Sons' Smurfit-Stone Building of 1984 and Anish Kapoor’s 2006 Cloud Gate frame other buildings on North Michigan Avenue whilst the 2009 Trump International Hotel & Tower designed by Adrian Smith with Skidmore, Owings and Merrill closes the view. 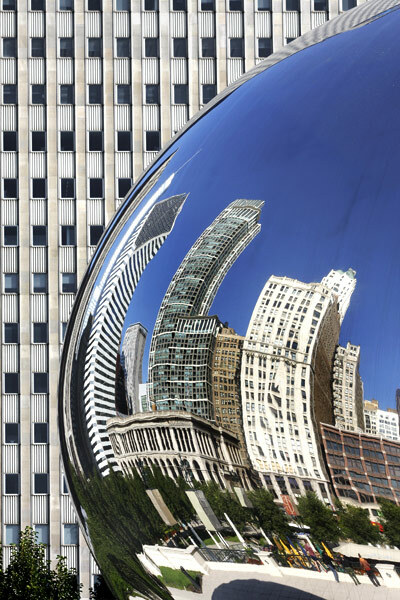 Further reflections in Cloud Gate are backed by the wide limestone façade of the 41-storey One Prudential Plaza Building completed in 1955 to designs by Ness & Murphy. The engineering and surface finish of the sculpture is remarkable but airborne dust and the contributions from perching and passing birds must present a constant cleaning task. The reflections fascinate. 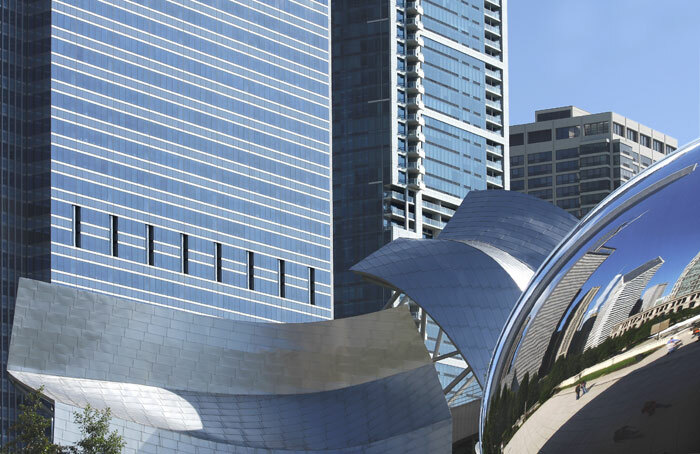 The 2004 Pritzker Center by Frank Gehry and Cloud Gate are backed by the 1997 Blue Cross Shield of Illinois Tower and the 340 On The Park apartment building. The former was designed originally by Lohan Associates and extended from 32 to 57 floors by Goetsch Partners in 2009. The latter tower has 62 floors and was built to designs by Solomon, Cordwell, Buenz & Associates. 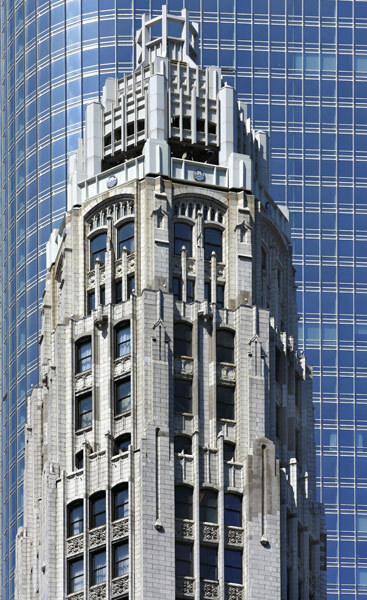 The tall, slender Lincoln Tower was designed by Herbert H. Riddle and completed in 1928. Steel framed and clad in stone it is just under ten feet wide at its top. 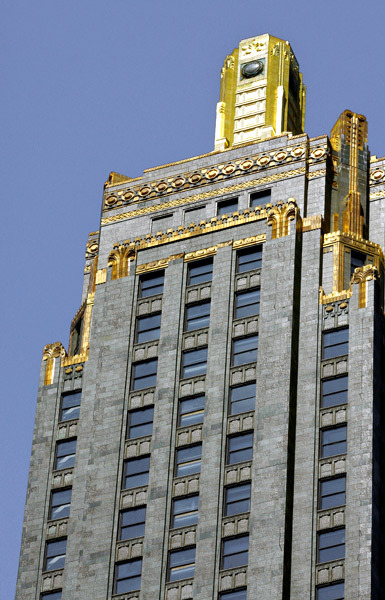 To the left is part of the 2009 Trump Tower and to the right the gilded Art Deco extravagance of the 1929 Carbide and Carbon Building By Daniel & Hubert Burnham. 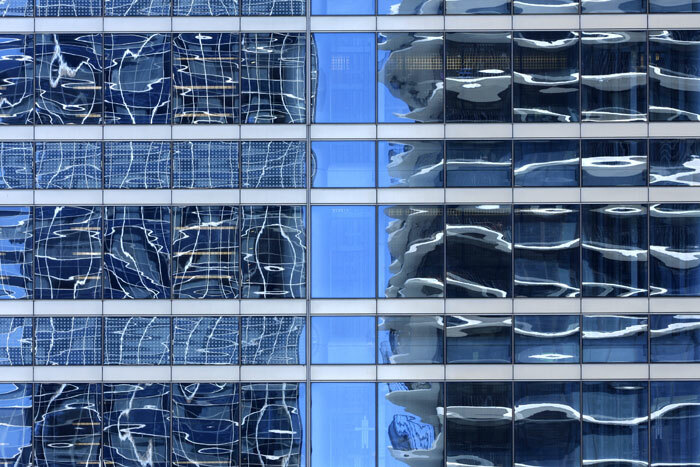 Here, the upper storeys of the Lincoln Tower are backed by the pale blue metallic tones of the Trump Tower completed in 2009. 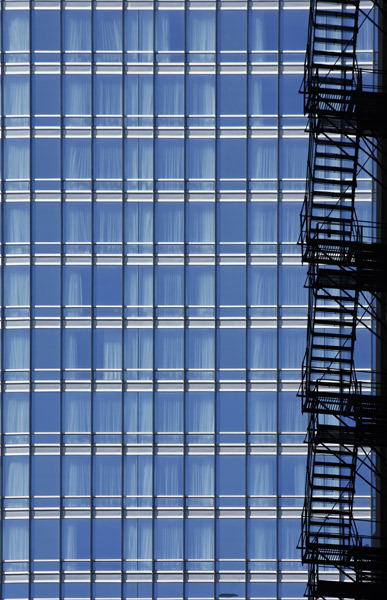 The Trump Tower provides a background to this fire escape detail on. I think, the western side of Alfred Schuler’s London Guarantee & Accident Building of 1923. 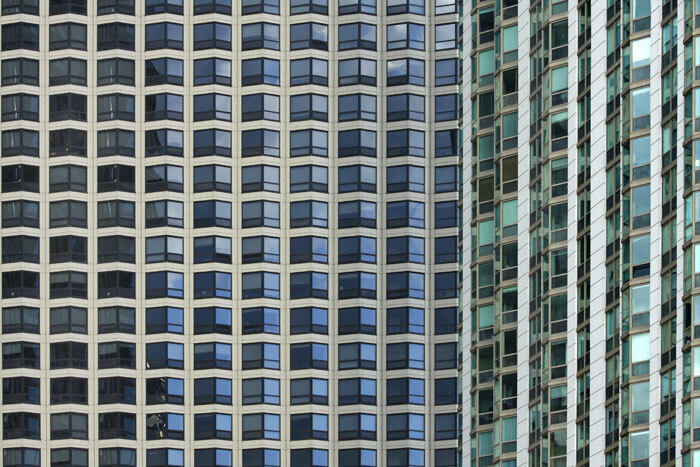 The latter's main façade is shown in Chicago Riverside Architecture 14. The Trump Tower provides a background to this fire escape detail on the western side of Alfred Schuler’s London Guarantee & Accident Building of 1923. The latter’s main façade is shown in Chicago Riverside Architecture 14. 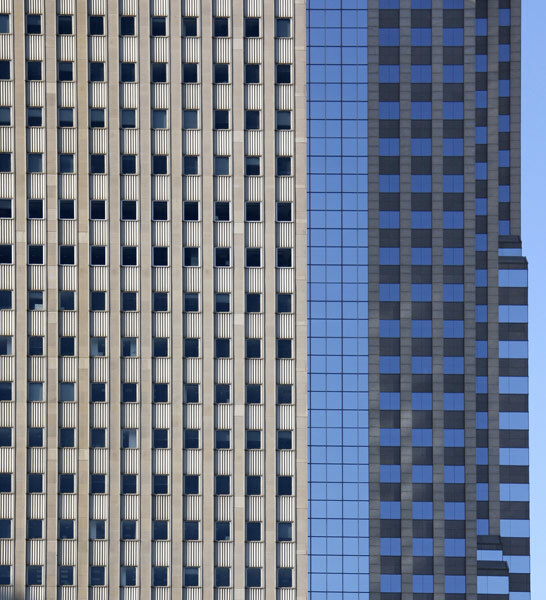 The off-white limestone cladding of the One Prudential Plaza Building contrasts with the much more exuberantly formed and blue-glazed 64-storey Two Prudential Plaza building standing offset behind. The latter was designed by Loebl, Sclossman & Hackl and completed in 1990. The chevron relief facades and pyramidal top make the building a distinctive feature on the city skyline. With 83 floors rising to over one thousand feet, the Standard Oil Building was completed in 1972 as the city's tallest building. Buckling and attachment problems with the original marble cladding caused its replacement by white granite between 1989 and 1992. 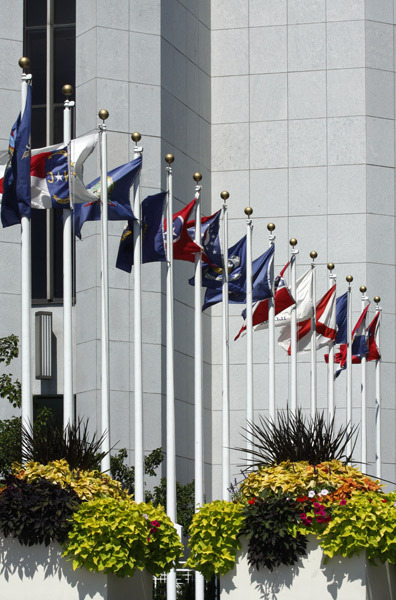 Its was renamed the Amoco Building in 1985 and then in 2001 became the Aon Center. The green-tinted fenestration of The Lake Shore tower completed in 1991 by Barancik, Conte & Associates contrasts with the more solid and cellular North Harbour Tower of 1988 designed by Fujikawa, Johnson & Associates. 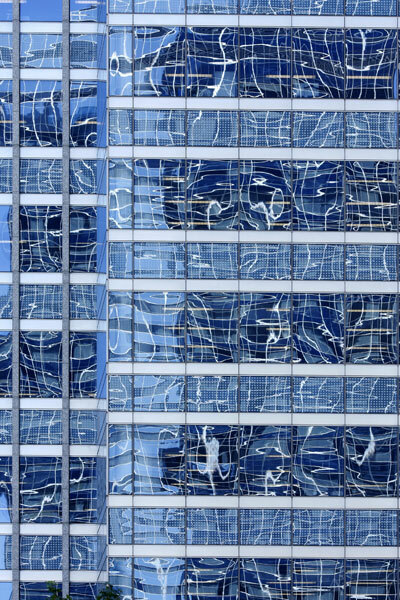 The Lake Shore Park facade of the Blue Cross Shield Tower reflects the dual-blue chessboard glazing of the triangular plan-form Swissotel and the undulating balconies of the nearly completed Aqua building. Moving a few yards to the left isolated further reflections of the Swissotel building against the recessed corner glazing of the Blue Cross Tower. 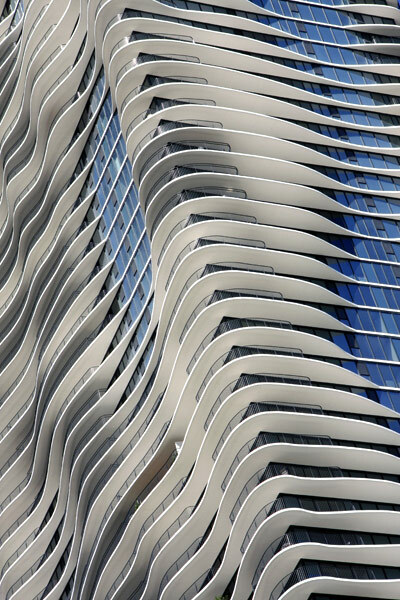 Designed by Studio Gang Architects, the 82 storey Aqua building will be completed in 2010. They comment: "Its powerful form suggests the limestone outcroppings and geological forces that shaped the Great Lakes Region". Each uniquely shaped concrete balcony is a floor extension from an otherwise conventional rectangular tower. Boston architects Shepley, Rutan & Coolidge designed the Art Institute of Chicago’s main building in Beaux Arts style as part of the 1893 World’s Columbian Exposition. 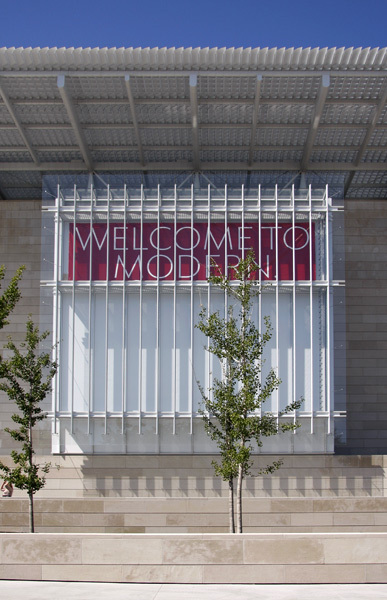 2009 saw the completion of The Modern Wing designed by Enzo Piano as a steel, glass and stone pavilion protected by an open slatted canopy. 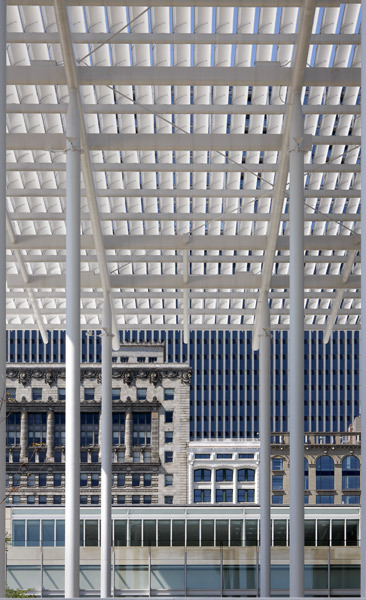 Here, part of its open structure frames fragments of Michigan Avenue facades. The new structure sits alongside an earlier extension to the 1893 building built at the other side of commuter rail tracks and linked to it by a bridging gallery. Its additional exhibition spaces makes the Art Institute the second largest art museum in the United States after New York's Metropolitan Museum of Art. 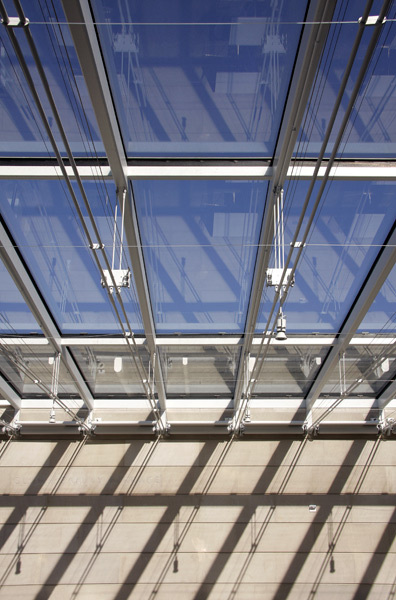 The partly glazed roof terrace affords views out to city buildings and is linked directly to the Millennium Park by a long and gently sloping footbridge. 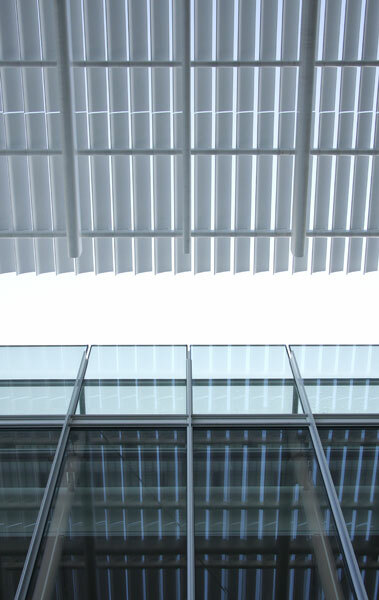 The engineering of the roof structure casts shadows and the tinted glazing supports reflections in constant change. I liked the abstract qualities of the forms, their relation to the structural materials and the elegance of the concept. This is part of the South Columbus Drive façade where the pale colours and white of the structure which will eventually be masked by the maturing trees. 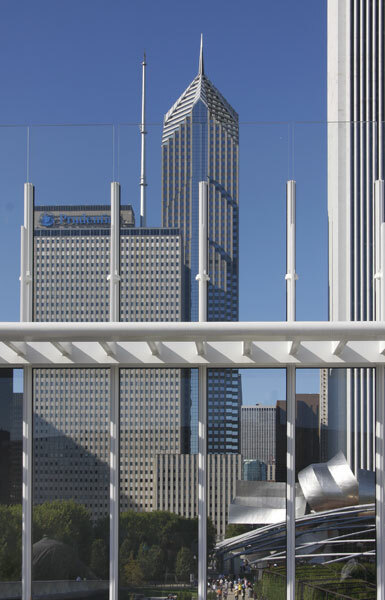 From the Modern Wing roof terrace the view is dominated by the Prudential Plaza buildings and the much taller white granite Aon Center, here edging tentatively into the composition. Looking left, Michigan Avenue has buildings only on its westward side and their facades front the mass of high-rise architecture in The Loop. A long footbridge links the terrace to the Millennium Park.